How to add credit to your Fulcrum plan. 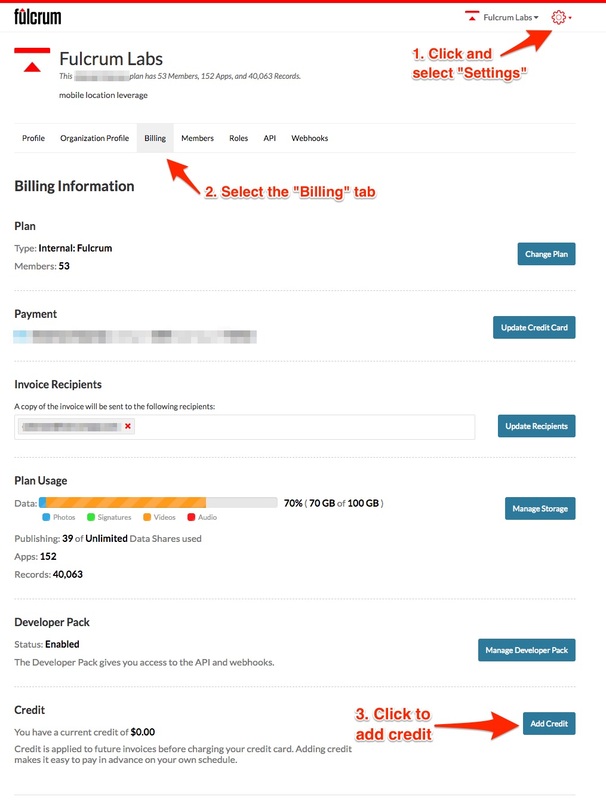 If you’d like to maintain the flexibility of the monthly Fulcrum billing cycle but prepay for your Fulcrum usage versus receiving a charge to your credit card each month for your monthly subscription, you can purchase account credits at any time. When you purchase an amount of credit up front, each monthly usage charge will be deducted from the credit amount, rather than creating new charges for each account activity. Credits allow you to purchase Fulcrum on your own payment schedule, like quarterly or annually, based on how your purchasing manager prefers to buy. Scroll down to see the Credit section and select add credit. Enter the dollar amount (USD) that you’d like to purchase. Each monthly charge will debit from this credit amount until you run out. When you run out of credits, billing activity for subsequent months will continue automatically on a month to month schedule.